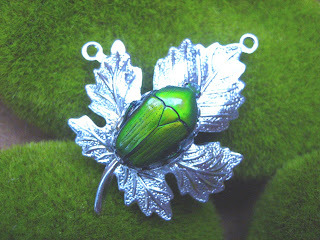 Insect Art: Jewelry Prototypes: Comments Wanted! 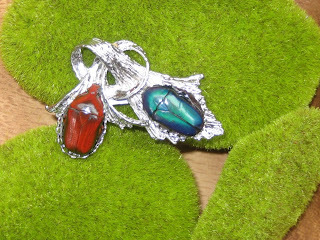 I have been asked recently to design a line of jewelry incorporating my bugs. At first, I was reluctant to try this, since the bugs are so fragile. Bugs are used to make jewelry, but other "bug-jewelry" makers get around this by using resin to completely encase the bug, creating a sort of "bug in amber" look. In this way, bugs are entombed in everything from glow-in-the-dark keychains to plastic bracelets to earrings. This protects the insects very well, but I think it looks cheap, personally. It hasn't been done in a way that is respectful to the beauty of the insect, in my humble opinion. So, if I were going to make any jewelry, it would have to be very different. I would have to like it. I laid awake for much of the night pondering how to get around having to encase bugs in resin. I'm not interested in making plastic jewelry. Also, I would also need a clear purpose or theme for my pieces. A reason for the art, so to speak. My main theme thus far has been to show off the natural beauty and diversity of insects to educate the public and encourage them to appreciate and conserve "un-cuddly" species, like insects. 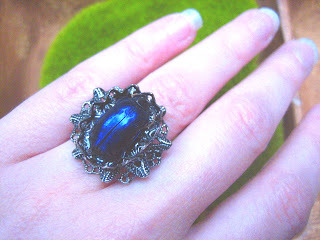 I would like to continue this theme in another media with the jewelry. There is a family of beetles which I frequenly use called "Jewel Beetles". Why not take their common name to the exteme and use them as literal jewels, the same as diamonds or emeralds. Why not buy ring settings and other metal bases and mount insects onto them instead of gems? Nice settings...silver and gold pieces instead of plastic. Yes, this was an exciting idea! 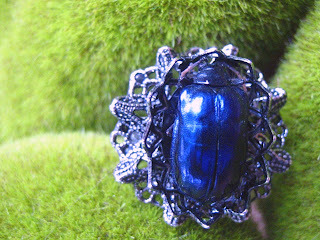 Imagine, a Tiffany ring setting with a shining beetle instead of a diamond! This stuff was going to be classy! However, there was still the fragility issue. 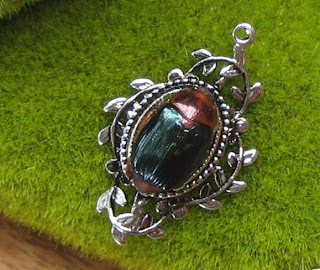 Could you just set a beetle onto a silver ring and expect it to last? I got to thinking about the centerpieces that were used at my wedding last August, just over a year ago. They were potted live orchids with real, dried beetles tucked in here and there. Just some of my extras and rejects....ones missing a leg or an antenna. Since they weren't worth anything, I just left them in the planters, on top of the potting bark. For the past year, I've been watering my orchids heavily, pouring water right over the beetles each time. The beetles look as good today, one year later, as they did on our wedding day. I have also seen other instances in the past couple of years where dried beetles were tougher than I expected. After all, they are made to live outdoors. They are pretty well waterproofed, and their shells (elytra) are quite scratch-resistant. Add to that the fact that Native Americans (South and Central American peoples) have historically used real beetles in their textiles and jewelry for thousands of years without encasing them in resin. Some of these textiles and jewelry survive today in museums, so it's apparent to me that these beetles are pretty tough. So, I decided that I would skip the resin and try mounting the insects directly in various types of metal jewelry mounts that are made to hold stones. I'd run "field tests" on my pieces, by wearing them around and exposing them to all kinds of normal wear and tear, noting what worked and what didn't. I got to scouring the internet, looking for pieces and parts the next day. The past couple of days, my materials have started arriving in the mail, and I've started to play around with putting some things together. Finding the correct beetles to use is the hardest part; they have to be the exact right size, and I want them to look as "jewel-like" as possible. I don't want my pieces to scream "I'm made with a real bug!". I want them to be beautiful because of their color and form, and they will reveal what they are made of when one looks closely. I want people to say "Wow, that's beautiful! What kind of stone is that?" 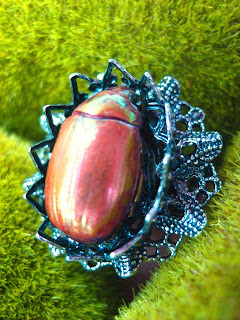 and then be amazed when they find out that insects can be that beautiful and worthy of a nice jewelry setting. 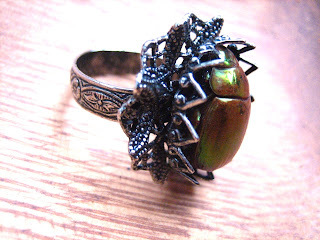 I don't want to scare people away from the jewelry; I want it to be sophisticated and not at all "creepy" because it is "made with a real bug". Rutelid ("Shining") Beetles are the obvious choice for me to use, but because of their shiny, jewel-like qualities, many of them command a hefty price. Way too much for my purposes, some of them costing $500 a piece. (!) I happened to have a few that I got as part of a mixed bag, so I'll use those for now and I'll work on finding a source for some more affordable species. I have finished up a few prototypes this morning, and would like to post them here to get your opinions and ideas. Keep in mind that they are my very first "sketches", if you will, and that I intend to refine them with more ideal parts and insects as I come across better materials. There are two rings here, one broach (pin), and two necklace pendants. I will let everyone know how the tests go, but I fully expect everything to wear very well, with the possible exception of the rings. Rings can get wet, but not excessively. You definitely wouldn't wear one of these while doing the dishes, but I think it would stand up okay to careful hand washing. If anyone is interested in testing out any of this jewelry, please drop me a line and let me know. I will sell you the pieces at very minimal cost in return for your reviews over the course of a couple months. I would love to hear your comments and ideas! Thanks for reading! I am UTTERLY in love with this idea. If you ever want someone to test a necklace or bracelet, I'm in! Your bug jewelry is gorgeous. You can always try coating them with Envirotex Lite coating and see if they last longer coated. Do you ship internationally? If yes, is there an additional cost? I'm in Bogota, Colombia. Have you ever thought of insuring this type of jewelry? I know conventional jewelers do, but I never really looked into statistics on how many craftspeople like yourself insure their own creations.